Photo via Catalina Island Marine Institute. 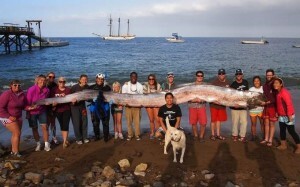 While snorkeling off the coast of southern California last Sunday (October 13, 2013), Jasmine Santana made what some are now calling “the discovery of a lifetime.” It was the silvery body of a dead, serpent-like oarfish measuring 18 feet (5.4 meters) in length. Santana, who is an instructor at the Catalina Island Marine Institute, dragged the carcass as far as she could toward shore, and needed more than 15 helpers to pull the oarfish to shore. Experts say these oarfish may have been responsible for ancient legends of sea serpents. The video below has more.